As versatile as a navy jacket is, it doesn’t cover all of a man’s bases. While we live in a climate-controlled world and rarely have to deal with the elements like generations before us, there are still times when a man finds himself outside and in need of seasonally appropriate clothing. Along with the functionality of having season-specific clothing, there are two distinct sartorial advantages. First, is the opportunity to have something fresh on rotation. Not wearing particular clothes for half the year makes them look and feel like a new purchase once they’ve been pulled out of storage. Second, it’s indicative of the intentionality a well-dressed man strives for. By knowing which materials are ideal in given seasons, it demonstrates a knowledge that can often be extrapolated to other areas. Don’t get the wrong idea, I doubt anyone has ever consciously thought, “this man is wearing a linen jacket in the summer, he must be well-thought, deliberate, and intelligent.” At the same time, it’s easy to see a man as absentminded or out of the loop when he’s wearing heavy tweed and it’s 95 degrees outside. Before breaking down the seasons and how to capitalize on them, it’s important to understand that these jackets are intended to be worn more casually. Think of them as something that’s appropriate with jeans, chinos, and even slim cargoes. They’re sport jackets, not suits. In order to ensure that they look and feel appropriately casual, there are some details to look for. With that being established, here’s how to break it down by season. Spring/Summer jackets should prioritize lightness and breathability over everything else. Ideally they’ll be made from materials like linen, silk, cotton, tropical-weight wools or any blend of the four. To maximize that necessary breathability, look for weaves that are more open or a seersucker for cotton (it doesn’t have to have the stripes). These allow for better airflow, which leads to a cooler-wearing garment. In that same vein, lighter colors are both consistent with the more casual attitudes associated with summer and are also better than dark colors when it comes to heat reflection. This entire thing is so light and minimal that it’s essentially a linen shirt that happens to be shaped like a jacket. I can wear it for hours without breaking a sweat. As a word of warning, if choosing a weave that is very open, something like a basketweave or a hopsack, I recommend still opting for a jacket with a canvassed chest. I’ve found that the weight of the cloth will misshape an open weave when there’s no canvas in the chest to function as a skeleton. If at all possible, request a summer-weight canvas as even these aspects of a jacket can be constructed with different weights and materials according to the season. Fall/Winter jackets are just the opposite. The materials used should prioritize retaining the heat put out by the body. Thicker cloths like flannel and tweed, made from winter-weight wool, cashmere, or a mix of the four are the go-to choices for cold weather pieces. Colors aren’t nearly as important as they are in the summer as no particular color helps retain body heat better than others. 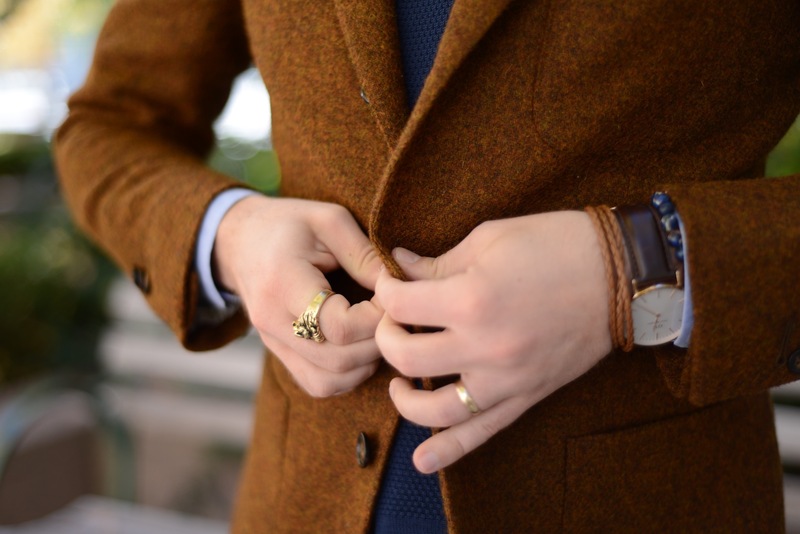 A lot of men I know still opt for a completely unstructured – even unlined – jacket for a fall/winter piece. The reason being that it ends up feeling more like a sweatshirt than a suit jacket or sport coat. One of the best aspects of the seasonal jacket, regardless of the time of year, is its wearability and versatility. It can be dressed up with trousers and a tie for a business-appropriate look, or thrown on over jeans and a casual shirt for something a bit more rakish. It should not be considered a special-event piece that is only worn when the occasion calls for it. Instead, it should be part of a well-dressed man’s regular rotation when he wants to go a bit beyond the normal T-shirt and jeans.